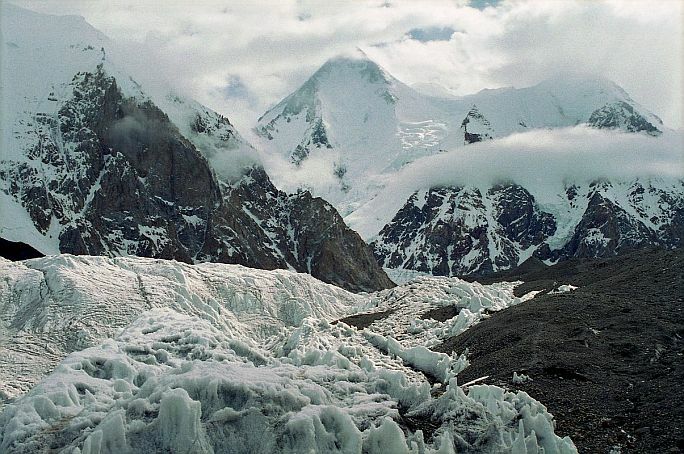 Gasherbrum 1 is the world's 11th highest peak. It is located on the Pakistan-China border at the northeastern end of the Baltoro Glacier and is part of a great massif. It soars to a height of 26,509 feet (8,080 m.). Its name comes from the Balti words "rgasha brum" meaning "beautiful mountain." It was first climbed by Pete Schoening and Andy Kauffman of an American expedition led by Nicholas B. Clinch, on July 5, 1958.